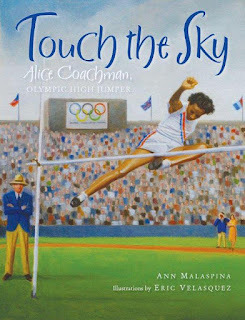 With the 2016 Olympic Games in Rio just around the corner, I am seeing more and more wonderful books that help our young readers understand the importance of this athletic milestone, but also to celebrate all of the notable athletes who have left their mark in Olympic history. Here are some of my top picks. The Quickest Kid in Clarksville written by Pat Zietlow Miller and illustrated by Coretta Scott King winner Frank Morrison, is a charming story about wanting to be the fastest kid in Clarksville. It’s also about determination, dreams, and the friends we meet along the way. In this fun review that is found right here on JIAB, we also take a look at the inspiring life of Wilma Rudolph; a three-time Olympic Gold medalist. Melissa at Imagination Soup has a great booklist to Get Kids Excited About the Summer Olympics with Books! What great Olympic-themed books have you read?